Autoimmunity is surprisingly common, and amazingly complex. About 5% of people will develop some form of autoimmune disease — that’s tens of millions of people in North America alone — yet the causes underlying the diseases are still not known. It’s clear that there are both genetic and non-genetic factors, because if one identical twins has an autoimmune disease the other is much more likely to also develop it; but even with identical twins the concordance is far from perfect, usually being well under 50%. In this genomic age, the genetic side of the equation is becoming more accessible, and large-scale genomic scans for gene variants that affect risk of autoimmune disease are becoming routine. But again — apart from outright mutations that cause autoimmune disease with very high penetrance, such as AIRE deficiency1 — there are clearly environmental factors that are at least as important as all the genetic factors put together. What’s the rest of the story? The usual assumption has been that the environmental factors are infections. If you’re genetically predisposed to autoimmune disease, this argument goes, then exposure to a particular pathogen may tip you over the brink. This might be because of cross-reactivity — the pathogen contains epitopes that look like self epitopes; the self epitopes are usually ignored because they are not seen in an inflammatory (“danger”) context; but the pathogen epitope is seen in such a context and drives the activation and expansion of cross-reactive T cells, that then return home and attack the self antigen, causing autoimmune disease that can then expand and become more severe. Perhaps springing from the general sense of dissatisfaction with the present explanations for autoimmune disease, there are two recent papers that propose a new, conceptually similar, but different explanations; and a letter to the editor that notes some weaknesses in one of the hypothesis. the potential for relentless growth of self-reactive lymphocytes is normally blocked by a series of checkpoint mechanisms that also prevent lymphoid neoplasia and … autoimmune outgrowths only develop when multiple checkpoints are eventually bypassed. He proposes that, in fact, autoimmune disease and lymphoid cancer share a common pathogenesis: Somatic mutations. Lymphocytes have a relatively high mutation rate (perhaps because they undergo somatic mutation as part of their normal maturation process), and perhaps some forms of this mutation cause dysregulation of the lymphocytes without causing cancer — a dysregulation presenting as abnormal self reactivity rather than uncontrolled growth. He puts forward a number of ancillary arguments and evidence supporting this, as well. By comparison, I think that most models of autoimmune disease postulate that the self-reactive lymphocytes are broadly normal; that everyone carries potentially self-reactive lymphocyte, but they aren’t activated by self antigen either because they are actively suppressed, and/or because they don’t receive adequate support during the self recognition process, or because the self antigen is normally hidden and not presented to the immune system. The second paper, by Pederson,6 addresses the third of these possibilities. His is also a somatic mutation hypothesis, but it’s quite different from Goodnow’s. 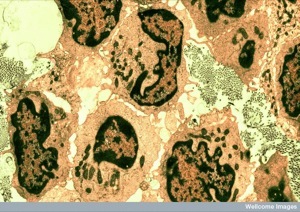 He suggests that the somatic mutation may hit the target cell, rather than the lymphocyte. It is here postulated that mutant proteins are formed randomly in non-malignant cells and can influence the immune system towards priming against self-antigens. If mutations are the result of somatic mutations in a stemcell such proteins will persist, but possibly cause no immediate harm … However, such mutant proteins might be pivotal in the break down of tolerance and induction of autoimmunity. Basically, Pederson’s hypothesis is that a mutated protein might be misfolded and/or degraded faster and this will result in increased recognition even of normal (“self”) epitopes in the mutant protein. This is a fairly plausible suggestion in itself — however, I’m not quite convinced. We’re talking here, I think, about quantitative increase in presentation, whereas most models of autoimmunity consider it to be somehow qualitatively different. (Of course, if you get quantitative enough, things become qualitative, if you see what I mean. Still, it seems like a relatively conservative hypothesis, somehow.) As Pederson points out himself, testing this hypothesis might be extremely difficult, because you’d have to identify a very small population of mutated protein swimming in the pool of normal unmutated protein. (Also — my own addition to the difficulty — by the time the disease is apparent, the mutated cells would have probably been destroyed by the initial autoimmune response.) Overall, I have a hard time getting very excited by this hypothesis — not by any means because it is self-evidently wrong, but it’s not clear to me how to test it, or where to take the next step in using it in a model for pathogenesis or treatment. Since submitting this manuscript, my colleague Dr. Stephen Daley has drawn my attention to F.M. Burnet’s extraordinary 1972 book (Burnet, 1972). 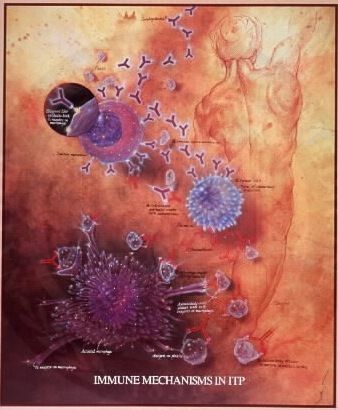 This monograph assembled the limited information about lymphocytes at that time to arrive at the same hypothesis developed here-that the stochastic onset of autoimmunity reflects “a conditioned malignancy” caused by emergence of “forbidden clones” through a combination of germline and somatic mutations that disrupt the normal mechanisms for eliminating or inactivating self-reactive lymphocytes. I was reminded of a graduate lecture course given by Professor Roderick MacLeod in 1995 at the University of Illinois. While introducing F.M. Burnet’s clonal selection theory to our small class, Professor MacLeod mentioned Burnet’s idea that germline and somatic mutations provide the inherited and stochastic mechanisms that disrupt tolerance and result in autoimmunity. As I say none of these points is itself insuperable; there are reasonable explanations that could account for all of them. But as far as I can think of there is no single explanation that will account for all of them, so we are multiplying William of Occam’s entities to an uncomfortable point. Nevertheless, I think Goodnow’s hypothesis is a very interesting — and testable — one, that also offers conceptual avenues toward treatment and prevention; even if it’s wrong, I think it’s wrong in an interesting way. I’m looking forward to seeing what happens to it in the next couple years.